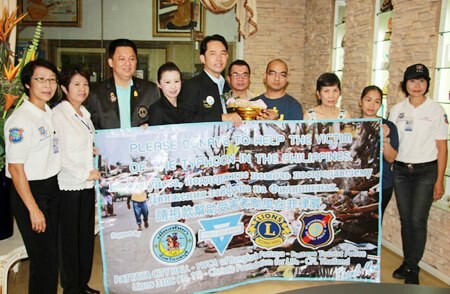 Pattaya-area charity organizations joined to aid the disaster-stricken Philippines, sending more than 40,000 baht to victims of Typhoon Haiyan. Mayor Itthiphol Kunplome and Y.W.C.A. 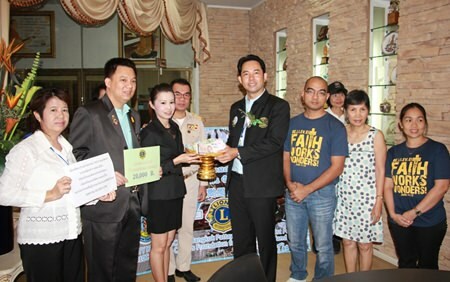 Bangkok-Pattaya Center Chairwoman Praichit Jetpai joined tourism police volunteers and members of the Lions Club of Pratamnak-Pattaya to present 43,500 baht to Yu-een Khapis of Couples for Christ Faith Family Life at city hall Nov. 25. Mayor Itthiphol Kunplome (center), representing Pattaya charity groups, presents a large donation to Yu-een Khapis (4th right) from the Couples for Christ Faith Family Life, to help Philippine victims of Typhoon Haiyan. Itthiphol explained that the Y.W.C.A., volunteers and Lions Club collected donations Nov 23-24 on Walking Street with a large number of tourists giving. Likely the strongest cyclone ever to hit land, super typhoon Haiyan had officially killed 3,976 Filipinos with authorities estimating another 10,000 may have died. Worst affected were the islands of Leyte and Samar, with cataclysmic damage. Many areas remained inaccessible a week after the Nov. 7 storm and many still had no food or shelter.